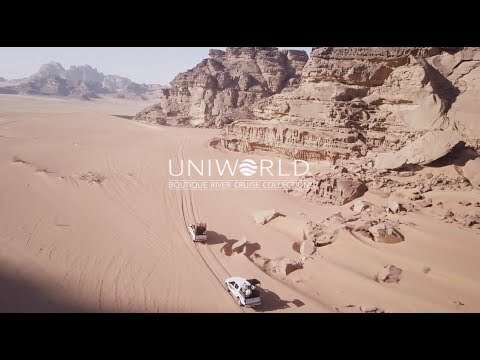 When you travel with Uniworld on our new 2019 Amman and Petra pre-cruise/tour extension you are helping to support local communities through our partnership with The TreadRight Foundation. See how you can make travel matter for the Jordanian women of the Iraq al-Amir Women’s Cooperative. For solo travelers, there is a single supplement of $479. Note: This extension is for cruise/tours that begin in Cairo. A minimum number of participants is required to operate these extensions. Explore ancient ruins and rock-cut masterpieces on this 5-day pre-cruise/tour extension in Jordan. Thousands of years of history are yours to uncover as you wind your way through destinations brimming with archaeological wonders, mountainous landscapes and ancient ruins. This insightful discovery will open your eyes to the magnificence of this not-to-miss country. Please note: A tour manager will be with you throughout the itinerary to facilitate flights, excursions, hotel changes and any other needs guests may have. Upon your arrival at Queen Alia International Airport, you’ll be greeted by a Uniworld representative and transferred to your hotel in Amman for the night. Savor a delightful breakfast in Amman before heading off to the ancient city of Jerash, which has been inhabited since the Bronze Age. As one of the original 10 great Roman cities, Jersash is now the site of one of the best-preserved Roman provincial towns in the world. After being hidden for centuries in sand and only uncovered in recent decades, the preserved Roman town features some of the finest examples of colonnaded streets, soaring hilltop temples, beautiful theaters, spacious public squares and city walls pierced by towers and gates—all of which you’ll see on today’s tour. Later, you’ll arrive at your hotel in Petra. The “Red Rose City” of Petra beckons today, with its massive red mountains and vast mausoleums. Although much has been written about Petra, nothing truly prepares you for this astonishing city. You’ll enter the city through the Siq, a narrow walkway that’s flanked by colorful towering cliffs on both sides. As you reach the end, you’ll witness the stunning Al-Khazneh, one of the most intricate and iconic temples in the city. Then, you’ll enter the indescribable Petra Valley, with its overwhelming natural beauty and outstanding architectural achievements—there are hundreds of elaborate rock-cut tombs with intricate carvings. Here also sits a vast Nabatean-built, Roman-style theater—and high above rests the impressive Ad-Deir Monastery, accessible by a flight of 800 rock-cut steps. Start your day with visits to Shobak Castle, Mount Nebo and the Madaba Map. Originally built by crusaders in 1115, Shobak Castle withstood dozens of attacks with its forbidding gate and an encircling triple wall. Perhaps the most revered holy site in Jordan, Mount Nebo was allegedly the place where Moses was buried. After Moses’ death, early Christians built a small Byzantine church, which has since been transformed into a vast complex. The Madaba Map, located in the Greek Orthodox church of St. George, contains the oldest surviving cartographic depiction of the Holy Land and Jerusalem. Only about a quarter of the original map, which dates from the sixth century AD, remains today. After lunch, you’ll enjoy a fascinating panoramic tour of the city. You’ll pass by notable sites such as the citadel, a 6,000-seat Roman amphitheater and downtown Amman before settling into the luxurious Fairmont Amman hotel for the night. Today, you’ll check out of your hotel and transfer to the Queen Alia International Airport for your flight to Cairo, where you’ll embark on your Splendors of Egypt & the Nile cruise/tour. For solo travelers, there is a single supplement of $809. Note: This extension is for cruise/tours that end in Cairo. A minimum number of participants is required to operate these extensions. Jerusalem is a city rich in history, religion and heritage—all of which you’ll discover on this 5-day post-cruise/tour extension that will take you to some of the oldest and holiest sites in the world. From the fascinating Old City to the vibrant downtown, there’s no shortage of ways to uncover this city’s enthralling past and captivating present. Upon your arrival in Jerusalem, you’ll be greeted by a Uniworld representative, transferred to your hotel for check-in and have the rest of the day to explore at your leisure. As one of the oldest cities in the world, there’s plenty to experience—including the Mahane Yehuda Market and its more than 250 vendors. Please note: There will be a hospitality desk for guest questions at the hotel. During excursions, hosts will be able to assist guests. Set out on a half-day tour of this fascinating city, starting with a visit to Yad Vashem. Established in 1953, Yad Vashem is the global center for documentation, research, education and remembrance of the Holocaust. Located on the Hill of Remembrance, you’ll also tour the Children’s Memorial. Pay a visit to the Israel Museum, the country’s largest museum and a leading cultural institution. You’ll visit the Shrine of the Book, home of the Dead Sea Scrolls—ancient religious writings that were originally found in caves along the shores of the Dead Sea. On your way back to the hotel, you’ll pass by Israel’s Parliament House and Supreme Court building and then have the afternoon to explore at your leisure. Your local host will be delighted to provide you with suggestions on the best places to dine and other ways to experience the city like a local. You’ll begin today’s full-day city tour by entering the Old City of Jerusalem through the Lion’s Gate—which marks the start of Jesus’ trek from his condemnation to crucifixion. As you venture into the Muslim Quarter, you’ll visit the Pool of Bethesda, the site of one of Jesus’ miracles in which he healed a paralyzed man. From here, you’ll head toward Via Dolorosa. Many Christian visitors walk the winding path believed to be Jesus’ route to the spot where he was crucified. There are some 14 spots along the way that each mark a different event in Jesus’ journey as he carried his cross. Make sure to take in fantastic views of the city from the Temple Mount. It was here that King David captured Jerusalem and made it the capital of the Israelites as well as the spot that would house the Ark of the Covenant. A visit to what is largely considered the world’s holiest Christian site—the Church of the Holy Sepulchre—is up next. The extraordinary church stands on the site where Jesus was crucified and buried. This afternoon, you’ll hop on a motorcoach for a short drive to neighboring Bethlehem, Kind David’s hometown and Jesus’ birthplace. Since we’ll be crossing over into Palestinian Authority, you’ll be guided by a local Palestinian through Manger Square and the Church of the Nativity. Later, you’ll enter the serene site of the Garden Tomb. This rock-cut tomb and holy site is said to be the place where Jesus was buried and later resurrected. Start your last full day in Jerusalem atop the Mount of Olives for a tremendous view of the city. Since ancient times, the Mount of Olives has acted as one of the main burial grounds in Jerusalem for all three monotheistic religions. The foot of the Mount of Olives is said to be the location where Jesus prayed following the Last Supper. You’ll then embark on a drive through Kidron Valley to Mount Zion, where you’ll see the sites of the Last Supper and King David’s tomb before entering the Old City through the Zion Gate. One of the holiest sites in Judaism, the Western Wall, beckons here. Visitors will notice that many of the cracks between the blocks are filled with prayers written on paper. The final stop is the Davidson Center and Jerusalem Archaeological Park, which showcases more than 2,000 years of the country’s history. After a delightful breakfast, you’ll check out of your hotel and will be transferred to the airport for your flight home.